Bangkok, Thailand -- His clerical name is Phra Brahmavamso. His official Buddhist title in the Thai ecclesiastical hierarchy is Phra Visutisangvornthera. 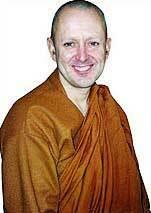 But the UK-born monk is known internationally as Ajahn Brahm. And he likes it that way - short and simple. He likes his teachings to be that way too. Ajahn Brahm's accessible and practical teachings, delivered with a humorous touch, have won him an international following. 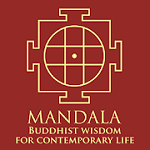 Ordained for 32 years and trained under the late meditation master and forest monk Ajahn Chah, he is now abbot of the Bodhinyana Monastery in Australia. Following are excerpts from his book Opening the Door of Your Heart and Other Buddhist Tales of Happiness, which has been translated into eight languages, including Thai. Unpleasant things happen in life. They happen to everyone. The only difference between a happy person and one who gets depressed is how they respond to disasters. We did not order it. So we say, "Why me?" We're stuck with it. No one, not even our best friends, can take it away (though they may try). It is so awful, such a destroyer of our happiness, and its pain fills our whole life. It is almost impossible to endure. There are two ways of responding to being stuck with a truck-load of dung. The first is to carry the dung around with us. We put some in our pockets, in our bags and up our shirts. We find that when we carry dung around, we lose a lot of friends! Even best friends don't seem to hang around so often. Moreover, the pile of dung gets no less, but the smell gets worse as it ripens. "Carrying around the dung" is a metaphor for sinking into depression, negativity or anger. Fortunately, there's a second way. We can heave a sigh, then get down to work. We fork the dung into the barrow, wheel it around the back of the house, and dig it into the garden. This is tiring and difficult work, but we know there's no other option. Sometimes, all we can manage is half a barrow a day. But we're doing something about the problem, rather than fretting our way into depression. Day after day we dig, and the pile gets smaller. Sometimes it takes several years, but the morning does come when we see that the dung in front of our house is all gone. Furthermore, a miracle has happened in another part of our house. Our garden blooms. "Digging in the dung" is a metaphor for welcoming the tragedies as fertiliser for life. It is work that we have to do alone: No one can help us here. But by digging it into the garden of our heart, day by day, the pile of pain gets less. The morning does come when we see no more pain in our life, and in our heart, a miracle has happened. Flowers of kindness are bursting out all over the place, and the fragrance of love wafts way down our street, to our neighbours, to our relations and even to passers-by. Then our wisdom tree in the corner is bending down to us, loaded with sweet insights into the nature of life. We share those delicious fruits freely, even with the passers-by, without ever planning to. When we have known tragic pain, learned its lesson and grown our garden, then we can put our arms around another in deep tragedy and say, softly, "I know." Compassion begins. If we haven't grown our garden yet, this can't be done. So if you want to be of service to the world, if you wish to follow the path of compassion, then the next time a tragedy occurs in your life, you may say, "Whoopee! More fertiliser for my garden!" When I was around 13, my father told me something that would change my life. He said this: "Son, whatever you do in your life, know this. The door of my house will always be open to you." Our home at that time was a small council flat in a poor part of London, not much of a house to open a door into. But then I realised that this was not what my Dad really meant. What was lying within my father's words was the most articulate expression of love that I know: "Son, whatever you do in your life, know this. The door of my heart will always be open to you." My father was offering unconditional love. No strings attached. I was his son and that was enough. It takes courage and wisdom to say those words to another, to open the door of your heart to somebody else, with no "ifs". Perhaps we might think they would take advantage of us, but that's not how it works, not in my experience. When you are given that sort of love from another, it's like receiving the most precious of gifts. You treasure it, keep it close to your heart, lest it be lost. Even though at the time I only partially understood my Dad's meaning, even so I wouldn't dare hurt such a man. If you give those words to someone close to you, if you really mean them, if they come from your heart, then that person will reach upwards, not downwards, to meet your love. We also need to learn how to love ourselves, to say, "Me. The one I've been so close to for as long as I can remember. Myself. The door of my heart is open to me as well. All of me no matter what I have done. Come in." When we were building our monastery in Australia, we couldn't afford to employ a builder so I had to learn how to build. When I had completed my first wall, after carefully laying it brick by brick, I noticed - oh no! - I'd missed two bricks. All the other bricks were nicely in line, but these two were inclined at an angle. They looked terrible. They spoiled the whole wall. They ruined it. I was very embarrassed by it and hated anyone seeing it. Then one day, I was walking with a visitor and he saw the wall. "That's a nice wall," he casually remarked. "Sir," I replied in surprise. "Have you left your glasses in the car? Can't you see those two bad bricks which spoil the whole wall?" What he said next changed my whole view of the wall, of myself, and of many other aspects of life. He said, "Yes, I can see those two bad bricks. But I can also see the 998 good bricks as well." How many people end a relationship or get divorced because all they can see in their partner are "two bad bricks"? How many of us become depressed or even contemplate suicide because all we can see in ourselves are "two bad bricks"? The mistakes are all we see, and they're all we think are there, so we want to destroy them. And sometimes, sadly, we do destroy a "very nice wall". We've all got our two bad bricks, but the perfect bricks in each one of us are much, much more than the mistakes. 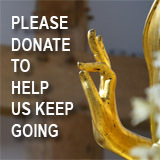 The English version of Ajahn Brahm's book will be available from Asia Books starting next week. The Thai language version can be downloaded as a PDF file from http://www.thawsischool.com. The book is currently being reprinted and will be ready next month. As it is being offered free, supplies are limited. Check back for announcements on availability at http://www.thawsischool.com or on 02-713-3674 or 02-713-0260/1. Parties interested in helping sponsor reprints may also contact this number.